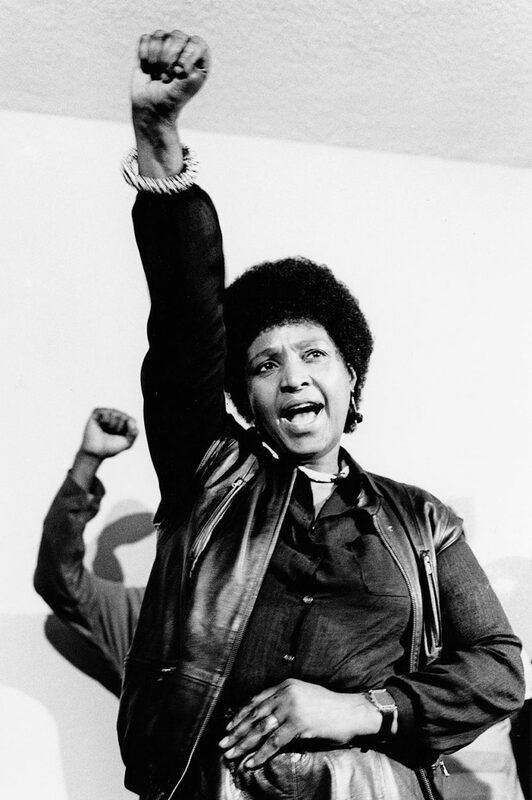 The national and international outcry since Winnie Madikizela-Mandela’s passing has brought about much vilification to the late freedom fighters life. As many people have come to acknowledge, far too late, is that Mama Winnie was the real hero of apartheid. While most of the men were in hiding or in prison, she was the one facing the brutality of the racist South African regime day in and day out. She endured the daily harassment, the spying, and slander. And yet, she managed to stay poised and became even more determined in the face of adversity. Unfortunately, at the time it mattered most, everyone turned their backs on the revolutionary. Though they tried to erase Winnie from the history books but her death has brought about her truth, ensuring her legacy will not be forgotten. Have you ever wondered why Mama Winnie was banished once apartheid ended? Ever wondered why she was the most feared by the apartheid government’s security forces? It’s because here was a woman. A young, black woman who was left alone as a single mother. And yet, she was defiant throughout it all. That terrified the apartheid regime and it terrified the incoming ANC government. Someone with such resilience. Someone with such passion and vigour and love for her nation, scared them shitless. Only a woman could be as strong as Winnie was during those years. Only a woman could stoke such fears in men. Growing up, I’d always known Mama Winnie as President Nelson Mandela’s wife throughout apartheid. She was the woman in that now iconic picture of him being released after 27 years behind bars. She’s the woman standing behind him as he made his first speech as a free man. Thereafter, she was gone and replaced by a new wife. I feel robbed of history, knowing that there was not even one module on Winnie when I was at school, not one. Sure, she was mentioned but her contribution to the end of apartheid was made so insignificant, I never knew her sacrifices or her story until I was 19 and bought a copy of her book “491 Days”. It was by chance as well. I was at the airport and looking for something to read on a long-haul flight. I saw the book and was intrigued by the front cover which had Mama Winnie’s prison number on the front. I remember being quite surprised as I hadn’t realized that she too had spent time in jail. I bought the book and once I started reading, I couldn’t stop. I always get quite a rush when I discover new female freedom fighters, yet Winnie was not a new freedom fighter. She had fought the fight; she had led the struggle. It’s just that I had no idea about it. The story of apartheid and its fall seemed like such a man’s world. Apart from the Women’s March to the union buildings in 1956, women’s roles in the fight against racism and segregation were not as amplified as men’s. Yes, we know about Helen Joseph and Lilian Ngoyi, but what about the countless others we don’t know about? And so, with all the memorials held for Mama Winnie and listening to all the female politicians speaking about her with such fondness, with such love, it got me thinking. In a country where women are the majority, a country where a hero like Winnie lived, why have we still not got a political party for and run by women? There is no doubt Mama Winnie loved the ANC, even though I’m sure she knew she could start her own political party, she chose to stay with the party she had dedicated her life to. But with the continuing attacks against women, not just within politics but across the board, I think she’d agree that a new political party was needed. A party where reducing the ridiculous rates of femicide is a priority, a party where highlighting intersectionality is a priority, a party where creating an equal footing between women and men is a priority. Equal pay, equal representation, equal rights. These are all issues that I believe would be at the forefront of any manifesto Mama Winnie would have been involved in. A social worker by trade, she dedicated herself to her community and improving the lives of everyone, especially the lives of young people and women. To all the women in South African politics today, the stage has been set for you to cross party lines and come together to form a party that Mama Winnie would’ve wanted to join. It’s not enough to just have a league or a “wing”. It’s time to form a party that will stand firm in the face of the patriarchy, to stand firm in the face of adversity and contempt. It’s time for South African women of colour to come together to embrace and embody everything Winnie stood for, believed in and fought for. 2019 is around the corner and I know there are millions of women who are tired of being told how to behave, who are tired of being judged and demonized for things men get away with day in and day out. We’re looking for a party that we can believe in and add our voice to. The time for silencing a women’s narrative is over.